It's quite early where I am, and as my melatonin levels adjust I find myself here with time to share a little arrangement I made last week. Before it gets lost forever in the black hole that is my iphoto. Do you like it? I've been inspired so much by our students lately. They often place flowers quite high; sometimes it's awkward and I'll suggest they move a stem or two... other times I'll encourage them to continue, and I make a mental note to remember their wild design. 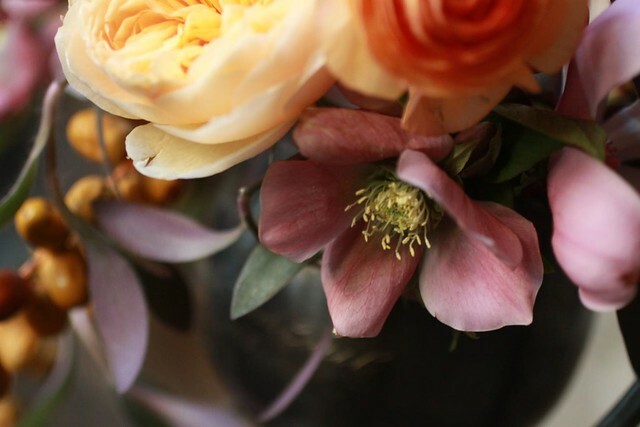 I can't tell you how much I learn about color and form from our students who have never arranged flowers before. It's one of the neatest things.. 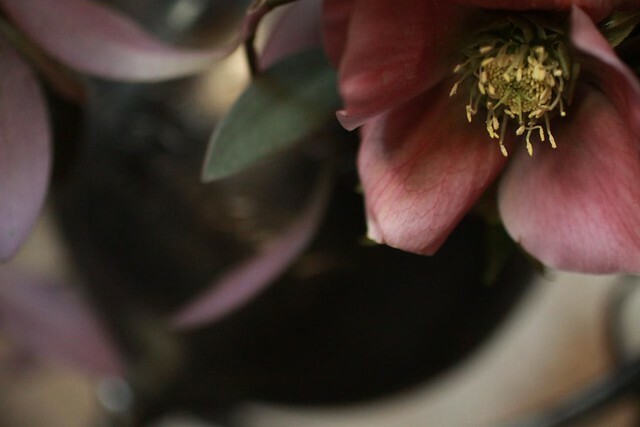 I know...we need to talk about hellebores at some point. Maybe after I get mine from SanFransisco later today...I'm so excited I can't stand it. Nicolette just got up, the sun is starting to rise, and we're off to the LA flower market to see what's in store for our class tonight. i really like the pitcher, do you have a place you'd recommend in Brooklyn/ Manhattan that sells them? This is beautiful. The arrangement and the photo of it. Looks like some gorgeous renaissance still life painted in oils. And, yes, LA IS strange. 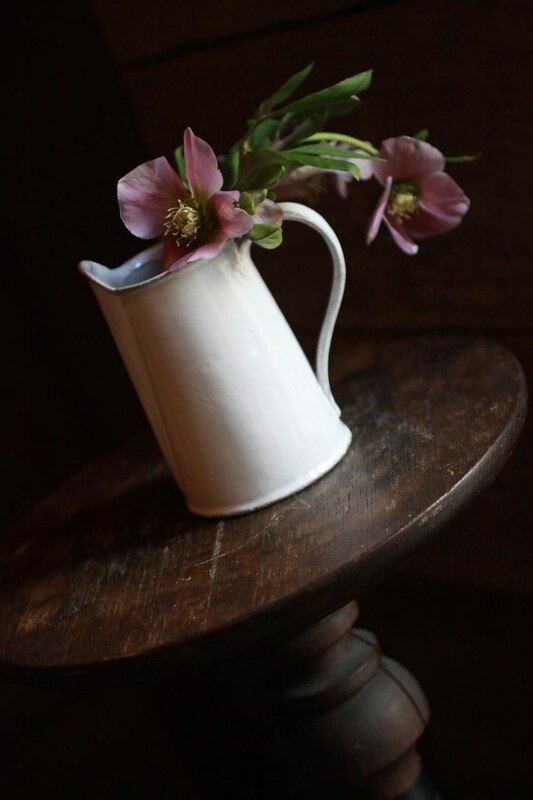 I have a potted hellebores sitting in our dining room, waiting for the day I'll hack at it and make something for myself. beautiful! especially with that dark backdrop. welcome to la! strange as it is, this place with its forever growing season and sunshine for days (and weeks and months) is home now. maybe we'll run into you at the market, but we'll definitely see you up in sf... can't wait! You know, Sarah, you are an artist. A very talented artist. GORG. Glad you are getting some sunshine. your pictures make me want to take up oil painting! i adore ure pictures, really...love ure blog! I'm a new lurker to your blog (i think via designsponge>studiochoo). Since you asked for feedback, I figured I'd respond... yes, I love the arrangement w/the tippy toed daffodil & orange berried lounger... I love how they're pulling in opposite directions... and the rich velvety dark backgrounds. You're work is an amazing new world to me that I love to take quick inspirational peek breaks to combat the doldrums of my cubicle graphic design job. Beautiful...can I ask do you anchor with frogs, build an armature with foliage, or nothing at all?? Also is the daffodil cut or a plant? Love your work, always inspiring. 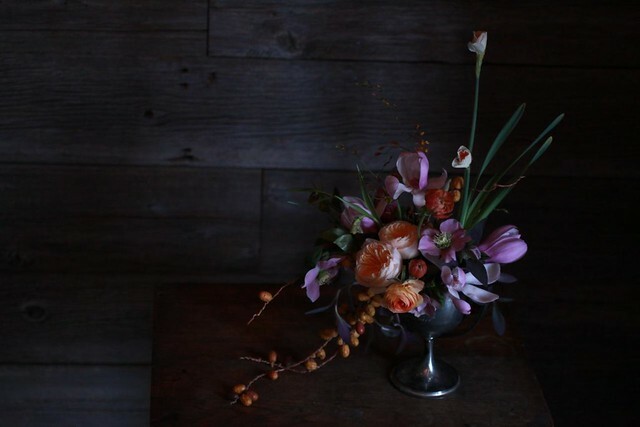 I live on the other side of the country, but have dreamed of attending your flower school. so bummed i missed the sign up....its gorgeous. I love your pictures baroque as the first one! it's great to learn from your students, they can open your mind..